Adorable onesie gift from KERF reader Sarah’s Etsy store, Chickadee Station! Can’t wait to meet my little eggplant. 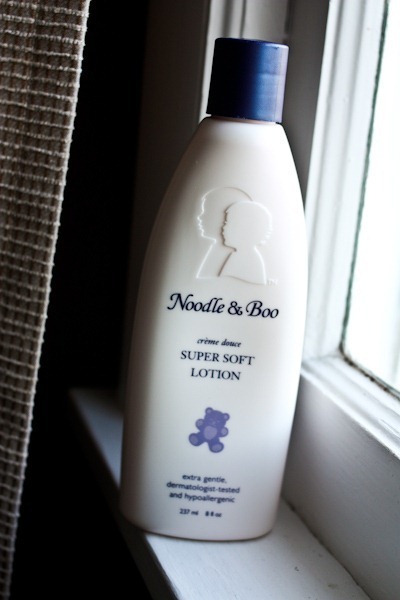 Totally bought this lotion at a baby store for ME because I just love the smell so much! I can’t believe how much my bump changes throughout the day! On this morning it was nearly flat when I woke up and much more rounded and poking out in the afternoon! I know the difference doesn’t look like much to you, but it was huge difference to me that day! I am in love with the crib! I love the clean lines and color. The little eggplant onesie is just precious! 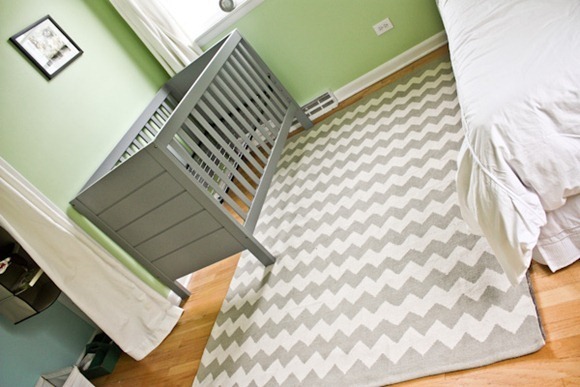 Wow, your nursery could be a page out of The Land of Nod- you have a great eye for color! Is that cream organic?? I’ve never heard of it! I’m not sure.. but it’s baby safe!? I LOVE your crib/rug combo. Our nursery has carpet but the wall and floor are similar colors and I’d kind of like a rug to give the room some contrast with a bit floor rug. Yeah, until the actually mega pop (for me it happened around 18wks but can be as late as 23wks) my belly would be flat in the morning and look super preg at night. Bloat!!! Actually it didn’t happen to me at all my first pregnancy but this time it was the weirdest thing and lasted longer than I thought possible. LOVE the crib and the colors! 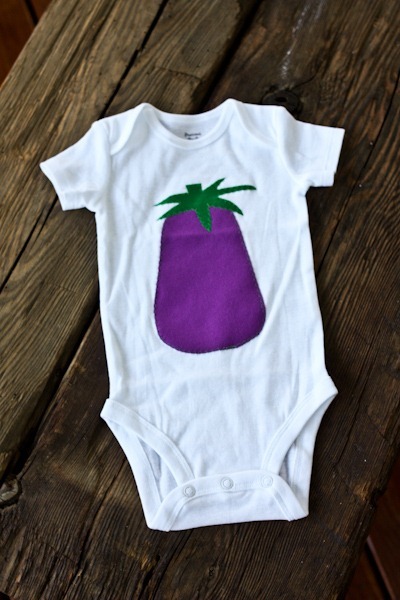 And the little eggplant onesie! Is it weird that I kind of want to live in your nursery? 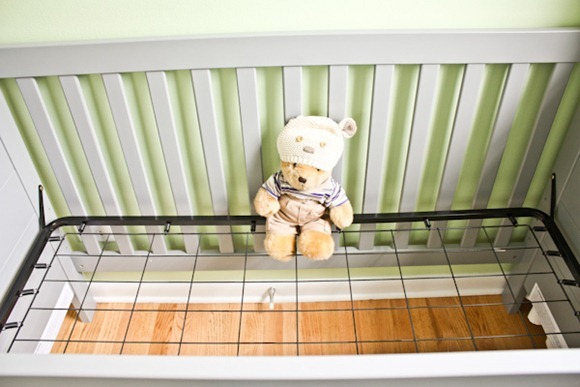 Love the bear with the bear hat 😉 I’ve already decided that my baby nursery is going to be vintage Winnie the Pooh…but that is a loooong way off! That eggplant onesie is the cutest! Bear has found a new home! The crib looks so nice! I like to smell clean like a baby, too–so light smelling, and not overpowering. I neeeeed that little eggplant shirt! How cute! ….It made my heart melt!….. Baby’s room looks GREAT Kath & Matt! My tummy does the same thing- in the morning flat or at least tight but by evening it really makes its presence known. Ohh yay the crib arrived! It’s so fun to see the room slowly come together. Yep, you’re starting to look like an expectant mother super cute! Kath the crib and the rug are PERFECT together! Wow…I knew you would be able to pull off the designing of this room from a variety of places. I remember when you said that it could be a bit of a gamble and the fact that the crib was routinely sold out, but the stars aligned. It just came together beautifully!!! Thanks for sharing my eggplant onsie! You should be my photographer…that’s a great picture! I’m dying for that eggplant onesie!!! Her tomato and broccoli ones are also adorable!! Congrats on the crib arrival! So exciting and fun to look at!! Love the eggplant! And looks like a certain bear is going to be an excellent big brother. LOVE your nursery color palette and style…I can’t wait to see it all put together! I am huge fan of your blog. it has been a while since I checked your website and I found your baby bump from your picture! Congratuation! Can’t believe I am 19 weeks along just like you! Just think, this time next year you’ll be making an Easter basket for your son! Love the crib and the rug! LOVE the crib and rug this room is going to look so cute when your all done. Have you gotten a rocking chair yet? Kath, what about a hanging porch swing that you could use to rock your baby? Coolest porch and a swing would be perfect when your baby needs that rocking/swinging motion? We have two rocking chairs out on the porch that I do hope to put to good use! SOOOO Loving the Gray and Green!! Don’t you love it when a plan comes together! !